Mine: In a class by itself. Great to watch. A ton of fun. Leonard Maltin/Plot synopsis: Call it corn if you like, but blockbuster Rodgers & Hammerstein musical based on Austria's real-life Von Trapp family, who fled their homeland in 1938 to escape from Nazi rule, pleased more people than practically any other film in history. Fine music, beautiful scenery help offset coy aspects of script. Five Oscars include Best Picture, Director, Score Adaptation (Irwin Kostal), Editing (William Reynolds). Screenplay by Ernest Lehman, based on the Howard Lindsay-Russel Crouse Broadway show. Songs include "Do Re Mi," "My Favorite Things," "Climb Ev'ry Mountain," "Edelweiss,"and title tune. 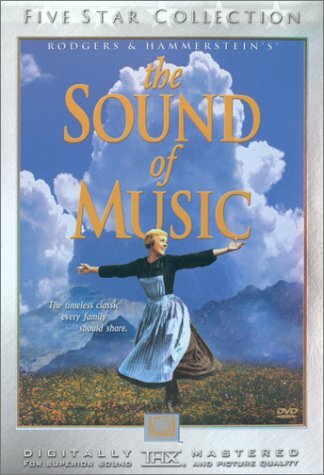 (out of 5 stars) The Sound of Music is an incredible movie, not only because it is actually shot in Austria, where the real story took place, but because of the loveable Julie Andrews. She makes the movie worth seeing! She litterally lights up the screen as she in the opening seen runs down an Austrian Alp singing The Sound of Music. I also think it is incredible that after all this time (the movie was first released in 1965) people all over the world still watch this movie. Just a few months ago it was shown on danish television, I mean this is a musical that will never die!